The Eagles' offense has struggled early on this season, which is understandable considering injuries. The Philadelphia Eagles came into the 2018 season with high expectations, because, you know, they won the Super Bowl last year. Through the first four games, the team has gotten out to a disappointing-but-deserved 2-2 start, and have not looked like the powerhouse that they were a year ago. • QB Carson Wentz: Through four games a season ago, Wentz played well, but he did not yet look like the MVP-caliber candidate who would emerge later. His turnovers were down and he made a number of athletic plays, but his deep ball accuracy was off. Remember that? It wasn't until the second quarter of the season that he really turned it on. I remain very surprised that Wentz did not begin the season as the starter. In terms of his mobility, what you're seeing from him on the field in his first two games is essentially what we saw out of him at the outset of training camp way back at the start of August. Ultimately, the team and its doctors opted to play it safe, a decision that was understandable. In his first game against the Colts, while Wentz looked good physically, he did not look the same mentally as he did a year ago. There were questionable decisions with the football, he was late on some throws, and he was unable to locate a few wide open receivers, but he made enough plays to win. In his second game Week 4, he played much better, throwing the ball with accuracy and confidence. • QB Nick Foles: In his two appearances, Foles was 54 of 82 (65.9%) for 451 yards (5.5 YPA), a TD, and an INT. Out of 34 quarterbacks with enough qualified passing attempts, he is 29th in the NFL in passer rating, at 78.9. I thought the eye test matched those numbers, though certainly, neither Wentz nor Foles had the advantage of a full complement of receivers. The Eagles originally signed Foles because he knew the offense, and at least gave you a chance to stay above water should the starter go down for a short period of time. Those expectations changed when Foles went on his incredible two-game tear against the Vikings in the NFC Championship Game and the Patriots in the Super Bowl, taking home Super Bowl MVP honors. In Week 1, Foles was bad against the Falcons, but the Eagles were fortunate that the defense was able to steal that game. In Week 2, Foles was better, but I believe that was the kind of game that Wentz could have put the team on his back and won. Objectively speaking, Foles looked more like a backup than a player some other team might be interested in trading for to be their starter. To be determined if he'll play again in 2018. • RB Jay Ajayi: Ajayi left the game early against the Buccaneers with what was later revealed to be a fracture in his back. He missed the following week against the Colts, but impressively, came back to play through what had to be substantial pain Week 4 in Tennessee. On the season, Ajayi's numbers are OK. He has 37 carries for 155 yards (4.2 YPC) and 3 TDs, but perhaps gets bonus points for gutting it out. • RB Corey Clement: Clement has 27 carries for 112 yards (4.1 YPC) and a TD. He played through a quad injury Week 3 against the Colts, but was unable to go Week 4 against the Titans. So far, Clement hasn't been bad by any stretch, but hasn't been special. He'll be more properly graded when he heals up and the roles for each of the running backs settle down. • RB Wendell Smallwood: Most (self included) saw Smallwood as unlikely to make the team when training camp began in July. But, he survived, mostly because his competition didn't step up and take his job. Through the first four games, however, Smallwood has run hard, and is actually averaging 5.6 yards per carry. He has 22 carries for 123 yards and a TD, which is good, though I believe he had a number of runs where he sort of "left meat on the bone," and still isn't exactly the best pass protector. Still, the Eagles have to be quite happy with what they have gotten out of Smallwood, as he has run hard and kept the Eagles' rushing offense afloat at times when they have dealt with multiple injuries. In his role as the fourth back, he has been very good. • RB Josh Adams: He has 6 carries for 30 yards, which is fine, but there really isn't much to judge him on. • WR Alshon Jeffery: Jeffery's return Week 4 made a huge difference in the overall look of the offense, as he hauled in 8 catches for 105 yards and a TD on 9 targets last Sunday. He is clearly the Eagles' best receiver, which was made obvious when he wasn't there. • WR Mike Wallace: In his limited action in one full game against the Falcons, and a quarter or so against the Bucs, Wallace did not have a single catch. Some might view that as a failure. I do not. There were times when Wallace was able to get a step on defenders deep down the field, but Foles was unable to give him a good chance to make a play on the ball. It would have been nice to see to see Wallace play with Wentz. Remember, there was a four-game stretch last season in which Torrey Smith had two catches for 17 yards. That was sort of the nature of the field-stretching role in the Eagles' offense last season, which seemed to carry over into 2018. They don't make many catches, but are there to make big plays when they present themselves, and serve to keep opposing defenses honest. It will be interesting to see what Wallace can do if/when he returns from his broken fibula. • WR Nelson Agholor: Nelson has had an oddball season so far. On the one hand, he's on pace for 100 catches! On the other hand, he's averaging a paltry 6.7 yards per catch, and he had four drops Week 4 against the Titans. Agholor broke out in a big way in 2017 after a dreadful start to his career in 2015 and 2016. He had not advanced his game to the next level in 2018 so far, in my opinion. • WR Jordan Matthews: Matthews got open for a 56-yard touchdown against the Titans, which stands as the biggest play of the season so far. In two games, he has 3 catches for 77 yards. Of course, he reminded us all of his flaws, when he had a bad drop against the Titans as well. Matthews is what he is, and so far, he's been an effective player considering he was on street looking for a job a couple weeks ago. • WR Kamar Aiken: Aiken has 6 catches for 53 yards. In Week 3 against the Colts, Aiken had 45 snaps, and no targets. That's almost hard to do. It's essentially playing the role of a traffic cone. Aiken has caught the ball when it has come his way, but he doesn't offer anything in the way of a plus skill set, from what I've seen so far. How little must the Eagles think of Shelton Gibson that he can't get on the field over Aiken? • WR Shelton Gibson: Obviously, the Eagles haven't liked enough of what they've seen of Gibson in practice, or he'd be playing the Wallace field-stretching role right now. Instead, he's barely playing in the regular offense, and he also lost his job as the team's kick returner. • WR DeAndre Carter: Carter was almost a hero on Sunday, with his big punt return near the end of regulation. In the regular offense, he was ineffective enough to get released by the team at one point. • TE Zach Ertz: Ertz was a little shaky out of the gate catching the football, and in my opinion, he should have been able to pick up a key fourth down against the Bucs, when he failed to fight through a tackle for a first down. Still, he is on pace for 124 catches. On the season, Ertz has 31 catches for 327 yards, though he hasn't found the end zone yet. That'll come. The Eagles' passing offense was a mess early this season with so many players out. How much worse could it have been without Ertz? • TE Dallas Goedert: The second-round rookie has been very good when he has gotten his opportunities. On the season, Goedert has 10 catches for 90 yards (9.0 YPC) and a TD, and he has blocked surprisingly well in the run game. He just needs more opportunities. But clearly, it looks like the Eagles have a found a good player here. 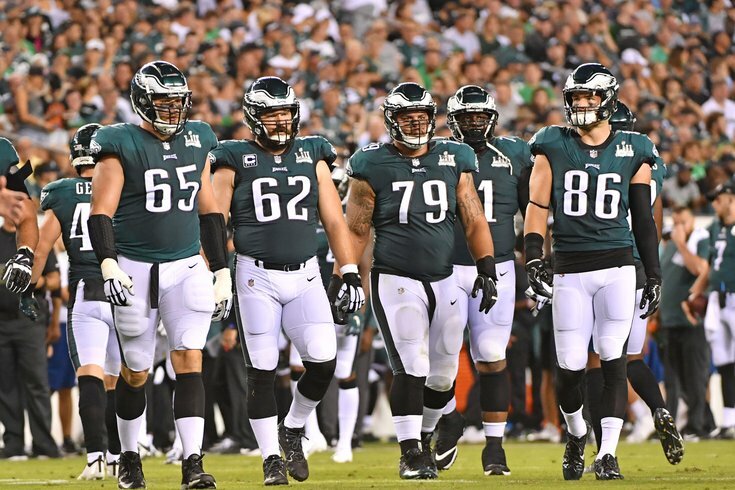 • TE Joshua Perkins: After Wallace went out Week 2 against the Buccaneers, the Eagles' staff opted to play Perkins at wide receiver, rather than throw out the game plan and go to more two-tight end sets with Ertz and Goedert. While I disagreed with that approach, it's not Perkins' fault. On the season, Perkins has 5 catches on 10 targets for 67 yards. While I believe he's been over-used, I think he's actually shown some ability and is worthy of the roster spot. • OT Jason Peters: Peters has battled through some injuries early, most notably a quad. He struggled at times against the Titans Week 4, and for the first time in his career, may be showing that Father Time is finally starting to get the upper hand on him? We'll see. I'm not ready to go there just yet, but if his current level of play continues into the second quarter of the season, then I think that it's a fair concern. • OG Stefen Wisniewski: I'd be lying if I said I've watched Wis closely so far this season, but nothing egregious has stood out, so we'll go with a lazy grade of a B here. • C Jason Kelce: The extreme athleticism doesn't seem to be there so far this year. The highlight reel blocks in space are missing, and the screen game has been out of whack. I don't think he's 100 percent. Despite that, he has still been very good, but just not the same elite level player he was in 2017. • RG Brandon Brooks: Brooks was a monster last year, which raised his expectations. He's been a perfectly fine blocker so far, but not the standout he was in 2017, kind of like Kelce. • RT Lane Johnson: Johnson was the best offensive tackle in the NFL last season. He has not been that so far in 2018. As Johnson noted on Tuesday, as an offensive lineman, you can block you man on every play but one, but people remember that one bad play. "That's the profession we chose," he acknowledged. That one bad play on Sunday resulted in a sack fumble of Wentz by Harold Landry, in which Wentz also took a big shot. It's probably also worth noting that Landry looks like a damn good player. Last season, Johnson was the star student, earning a 3.8 GPA. That "one bad play" almost never existed last year, but it has this year. Still, Johnson remains an elite player, but he is not off to his best start. The following grade is very much on a curve. • OT Halapoulivaati Vaitai: After a very concerning preseason in which Big V played poorly, I think he did a good enough job overall in relief of Peters Week 2 against the Buccaneers. • OL Isaac Seumalo: He has only played 13 snaps.